06:02 pm - Tok'ra Kree! Round 10 - Claiming ongoing! Prompting: May 15th - 28th, 2017. Claiming: May 29th - June 11th, 2017 (max 2 prompts). Claiming: June 12th - August 13th, 2017 (open claiming). Claiming Ends / Last Day To Drop Out: August 13th, 2017. Posting: August 14th - September 4th, 2017. Tok'ra Kree is a community for fan challenges focused on the Tok'ra from Stargate SG-1. The challenge is run as a prompt-a-thon. Fic/art can be any rating (G to NC-17), and gen, het, slash, femslash, poly... Any and all pairings (or none) are welcome! Stargate SG-1, Stargate Atlantis, Stargate Universe, the movies, as well as crossovers are welcome. One or more Tok'ra must play a major part in the fanwork and not just be there as a convenient source of information, a way to get a spaceship, someone to blame, or similar. They do not, however, have to be one of the main character(s). 10:23 am - The Tok'ra Kree! Prompt-a-thon Round 09 is now open for claiming! 03:06 pm - Tok'ra Kree! Round 8 - claiming period extended! Due to overlap with several other fic-a-thons, claiming has been extended until March 1st. Posting will be March 1st - March 14th. Go here to claim one of our 161 prompts! There is a great variety of characters, pairings, and shows! 02:09 pm - The Tok'ra Kree! Prompt-a-thon, round 8, is now open for claiming! 02:03 pm - The Tok'ra Kree! Prompt-a-thon, round 8, is now open for prompting! 12:46 am - The Tok'ra Kree! Prompt-a-thon is now open for prompting! 2015 is off to a Bang, Stargate style! Based on feedback after last year's SGA Reverse Big Bang, we're having a poll about interest and potential format changes for this year. Please drop by and give us your ideas if you're interested in creating art, fic, or other fanworks! Tok'ra Kree! is a Stargate 'verse Prompt-A-Thon for fanfic and fanart focusing on the Tok'ra from Stargate SG-1. 01:41 pm - Tok'ra Kree! - A Stargate Prompt-a-thon. Claiming open! Claiming is now open! 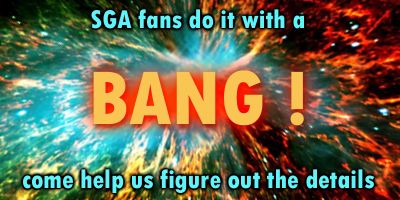 We have 191 prompts divided between SG-1, SGA, SGU, and non-Stargate fandoms. 02:31 pm - The Tok'ra Kree! Prompt-a-thon is now open for prompting! 07:31 pm - Tok'ra Kree! Round 4 - PROMPT CLAIMING OPEN! Tok'ra Kree! is a Stargate challenge for Tok'ra-related fanworks. Fic, art, and videoes welcome, as long as they are Tok'ra-related (Tok'ra has to play a bigger role than just providing intel/tech). Fanwork can be gen or any pairings. Any rating, any category - including crossovers/fusions. We got a LOT of prompts - 151! Claiming is open from November 9th and through November 23rd and you may claim up to two (2) prompts during this time. If you're feeling ambitious you may claim additional prompts after that, but please complete at least one of your original claims first. By claiming a prompt you are committing yourself to either writing a fic of at least 500 words, creating a medium sized piece of art, or making at least 5 icons. You may post your finished work at any time between January 24th and February 7th. Come claim a prompt or two! More information (LJ) and (DW). Author's Note: Written for the April prompt "foolish." Very minor spoilers for "Memento Mori" and "Unending." 04:37 pm - Tok'ra Kree! Round Two - Sign-ups has started! Tok'ra Kree! - a Stargate challenge for Tok'ra-centric fanworks. Fic, art, and videoes welcome, as long as the focus is on the Tok'ra. Fanwork can be gen or any pairings. Any rating, any category - including crossovers/fusions. Theme for Round Two: Rewrite an episode of SG-1, SGA, or SGU to include Tok'ra. Sign-ups and more information: DW | LJ. Sign-ups: April 29th - June 15th. Deadline for fanworks: June 29th (Sat). We would be grateful if you would promote the challenge in relevant places! With thanks to shena8 for the prompt! What can I post in this challenge? Any kind of fanart (fics, vids, art, podfic). It must follow the rules of the community and be somehow related to the theme encompassed by the word BUG. Links to recommendations are also welcome. Is there a time limit? Great if you can post within May but you can post any time through 2013. Just post tagging with the 2013 May challenge tag. You say the theme is the wod 'Bug'; but what do you mean? Some ideas...your art may focus on the characters interacting with bugs, becoming bugs, investigating bugs, fanfic recommendations about fanart involving bugs in some way! Or maybe do something like 5 Times Sam Was Bugged by Vala...or vice versa! Do I need to sign-up? No, but you will need to join as a member to post to the community. Don't forget that you can still post other fanart, links to challenges, etc. outside of the monthly challenge! Any questions, please comment to this post. 12:18 pm - Submit Your Prompts for Our May Challenge! In anticipation of kicking off our May challenge on 1st May, we are now taking suggestions for May's challenge. Please do submit a suggestion! We have so many in the community, it would be nice to get a good range of prompts. b) A phrase such as "It was in the middle of May when..." or "She'd always regret when..."
You can submit a prompt by commenting to this post. Submitting a prompt does not mean that you have to take part in the challenge although it would be great if more people did take part as that means more fanart for the rest of us to enjoy! You can register your support for somebody else's prompt by commenting to the prompt. The more support a particular prompt has the more likely it is to be chosen. The mod will announce the chosen prompt on May 1st with the issue of the challenge. The mod's decision and choice will be final. Any questions please comment to this post. Don't forget you can still submit entries for our previous challenges (Jan=Beginnings, Feb=Chocolate, March=Garden, April=Fool/Foolish). 09:37 pm - SGU wallpaper for April Challenge: "Linger"
Artist's Notes: Made for the April challenge "Fool" at gate_women. The song by The Cranberries was the very first thing that popped into my head when I saw the prompt. I've been humming it for a few days now, and then this wallpaper happened. At the end of the Season 2 episode "The Hunt" it becomes very clear that Young is not over TJ by a long shot, and the lyrics fit very well. Please leave comments at my LJ if it's not too much trouble. With thanks to una_spectre for the prompt! What can I post in this challenge? Any kind of fanart (fics, vids, art, podfic). It must follow the rules of the community and be somehow related to the theme encompassed by the word 'FOOL' or 'FOOLISH'. Links to recommendations are also welcome. Is there a time limit? Great if you can post within April but you can post any time through 2013. Just post tagging with the 2013 April challenge tag. I had a great idea for the previous challenges but haven't had time to start/finish, can I still post? You can still post any fanart related to the previous challenges, just use the relevant month challenge tag. 04:28 pm - Reminder: April Prompts Wanted! Just a reminder that you can leave a prompt for our April Challenge over on the Prompt Page. We have so many people in the community and so far only 1 prompt! You can leave your prompt over here. In anticipation of kicking off our April challenge on Monday 1st April, I hereby declare this prompt post open!! b) A phrase such as "It was in the middle of an April shower when..." or "She'd always regret that April when..."
You can submit a prompt by commenting to this post. You can vote for a prompt by commenting to the prompt. The mod will announce the winning prompt on Friday with the issue of the challenge. In the event of a tie or no prompts, the mod's decision and choice will be final. Any questions please comment to this post. Don't forget you can still submit entries for our previous challenges. Author's Note: Spoilers for SGU, set late S2. Author's Notes: Written for the March 2013 challenge "Garden" at gate_women. Tok'ra Kree! - a Stargate challenge for Tok'ra-centric fanworks. Fic, art, and videoes welcome, as long as the focus is on the Tok'ra. Fanwork can be gen or any pairings. Any rating, any category - including crossovers. First round started March 1st. Theme for Round One: Re-imagine an episode that has Tok'ra in it. What could have been done differently? With thanks to campylobacter for her list of prompt suggestions, I have chosen her prompt of the word GARDEN and this excellent picture as this month's theme. What can I post in this challenge? Any kind of fanart (fics, vids, art, podfic). It must follow the rules of the community and be somehow related to the theme encompassed by the picture and key word 'GARDEN'. Links to recommendations are also welcome. Is there a time limit? Great if you can post within March but you can post any time through 2013. Just post tagging with the 2013 March challenge tag. You say the theme is the picture and 'Garden'; but what do you mean? Some ideas...your art may focus on the picture as a background or accent, fanfic recommendations about fanart involving gardens, or stories which involve the ladies of Stargate and a garden of some kind! I had a great idea for the January and February challenges but haven't had time to start/finish, can I still post? You can still post any fanart related to the previous challenges, just use the relevant month challenge tag.